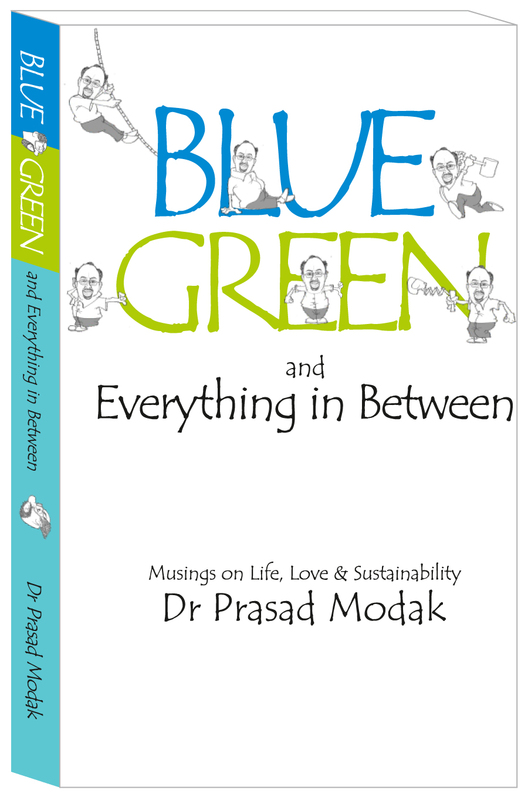 Enthused by your response to ‘Sixty Shades of Green: Musings on Sustainability‘, I have now brought out it’s companion edition, ‘Blue, Green and Everything in Between: Musings on Life, Love and Sustainability’ which pulls together another 50 of my blog posts. ‘Blue, Green and Everything in Between’ has a different sort of flavor – In these posts, I have related anecdotes from my personal experience with people, places and life. However, just like ‘Sixty Shades of Green’, I have adopted a semi-fictional and satirical style. In most of the posts, sustainability has been the focus. As before, the book comes with rich and attractive illustrations (doodles) but in a new design format. Take a look at the Table of Contents – TOC. Teaching Environmental Modeling with Hooke’s Law This piece is simply superb!! Modelling otherwise sounds so abstract for the learners. Pedagogy like this is much needed for the teaching of environmental science so as to get professionals who understand modelling, not the application of the modeling software. And this is true for so many other concepts of environmental science. It’s so frustrating when even the practitioners in field get confused on such basic things like organic pollutants and COD, using the terms interchangeably. A Competition So Funny! Humor at its best- alas! with subtle reality. Prasad – Very good summary on evolution of EA …..
Wastewater Treatment Plants that Speak Wow, ETPs / STPs personified!! Great reading. Fantastic style of narration to explain a complex issue of maintenance in an ETP. Good one Dr. Modak. Pretty realistic picture! I hope everyone realizes the urgency and we start on the path chalked out by you. It could be in the smallest possible way. I think we all owe that much to our future generations. Those Magical Days of GMDH It is very good article and I learnt many things. Well-crafted and informative. On reading the blog, I wished to iterate that you have an amazing array of knowledge, interest and experience in doing interesting things. Though I have no knowledge about GMDH but was definitely interested to read about it. Each and every blog of yours is so interesting to read as offers a new understanding about your experience and knowledge. We are enriched just be reading them. Thanks for sharing your old and new experiences. Indian Weddings now require Environmental Clearance Another hilarious “episode”. Good that the post marriage blues were not included as a compulsory “post audit”. Look forward to the next one. Dear Dr Modak. Good idea! Generation of new business avenues! May be getting EC report would eventually become a status symbol and a fashion to gossip about in high class clubs and social events! Depending upon the propaganda, there may be a prize announced for the family which spends highest amount and/or best EIA report for wedding-events. Wow! ECO WEDDING! Silence of the Lambs You are at it once again. The level of satire used is at a different level altogether. I hope all personnel and organization’s mentioned find a way to read this. Dear Dr Modak – excellent capture of current situation of Indian stakeholders in field of environment thru “silenced” sarcasm!! Good observations and excellent interpretation of current happenings in the present Indian environmental scenario. I do not see in near future any of our professional associations rising above their petty squabbles and contributing positively to the future policies. But, obviously blame ourselves for not participating and showing spine at the right time on subjects concerning issues beyond our daily routine. Inaction by good people at the right time, is more damaging than destructive action of “not -so -good ” people. Lets wake up , try and make a difference in the future. Professor’s Unique Beauty Salon Great piece of writing. Delightful blend of fantasy science reality politics with your softly biting comments. Enjoyed thoroughly Prasad! !! Taking a simple example of visiting saloon, so many Enviro terms are interwoven creating an awareness even for a ‘non-connected person’. Keep it up!